Long-term care for livestock requires you to have some knowledge about the nutrient density of the food you feed them. Different kinds of hay have differing amounts of minerals and protein, so knowing what kind you feed your animals is essential in knowing if you will need to supplement their feed at any point to keep them healthy. 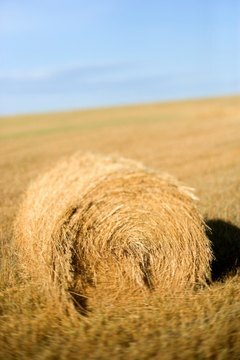 Hay is made from cutting grasses during different growth periods of the plant's life. The cycles of plant life range from the leafing period, to budding, flowering and going to seed. Most hay is cut between the bud and bloom phase, which maximizes the nutritional content of the hay. Farmers then allow the cut hay to dry in the field, curing it for baling and storage for future use, either to be sold or to be used as feed for livestock during the winter. Farmers divide hay into different categories, depending on what plants make it up. Categories of hay are legume, grass, cereal grain and a mixture of both legumes and grass. Red clover is one example of legume hay, while bermuda grass and fescue are two kinds of hay that come from grasses. A mixed hay would have both a legume and a grass. An example of a cereal grain would be oat straw. Grass hays tend to have more sugar if they grow in the winter versus those, like coastal bermuda grass, that grow in the summer. Hays from legumes tend to have more minerals like calcium and phosphorous. Hays that come from grains contain a lot of nitrates, especially if they have a growth spurt following a period of drought. Cereal grains should be tested for nitrate content before giving them to livestock because too many nitrates can poison an animal. Hay from grass and hay from legumes tend to complement each other as livestock feed because they provide a balanced diet. Grasses tend to have half or less the amount of protein than hay from legumes while grass has a higher amount of fiber and has a more appealing flavor. Since grass-eating livestock have sensitive stomachs, you should keep their diet consistent, or change from one kind of hay to another gradually so as not to upset their digestion. Comparing different kinds of hay, like alfalfa to timothy grass, shows you how different the protein content of hays can be. The percent of protein in an alfalfa plant is between 15 to 20 percent of the plant. Compare this to timothy grass hay in which the protein content is about half that of alfalfa, yielding about 7 to 11 percent crude protein. Tall fescue grass has a protein content of between 5 and 9 percent, orchard grass hay between 7 to 11 percent and red clover hay between 13 to 16 percent crude protein.